Our days now revolve around minimizing the impact of the extreme heat as much as possible. It turns out that we are not only riding the baja in one of the hottest months of the year, there has also been a heat wave over the last week or so! Despite the heat, however, we have miraculously managed to cover a good amount of distance in the last ten days and have even had our longest days (mileage-wise) yet. Today we are taking a very much needed day off in the Loreto, a small town that sits on the Sea of Cortez. Each morning we wake up about an hour before sunrise, when it is a cool 28-29 degrees Celsius out. We pack up our stuff, make some coffee (a time-consuming, but important task), eat some food and try to get on the road as soon as there is enough light for safe riding, in our current time zone this is between 7:00 and 7:30. The first hour of riding is pleasant, the second manageable, the third very sweaty, and by the forth we are dripping and baking, and it is usually in the 35-40 degree range at this point. Sometimes I think that it is raining, but then discover that, no, it is just my own sweat dripping on me. Around noon we try to find, or sometimes make, shade of some sort and rest for a few hours. I have discovered that if there is any kind of breeze using a damp cloth on the body creates about 30 seconds of glorious air conditioning. Around 3:00 or 4:00 we get back on the bikes and ride for anywhere from another hour to three hours....by this point the sun is not quite as harsh and we begin to benefit from more shade. When we make it to wherever we are staying, either camping or a cheap hotel we crash for a little while then organize some food and drink for the evening and the next morning.... We catch whatever sleep we can get in the heat, and in the morning we do it all again. For me, this has been the most challenging riding yet. The heat makes it so that I cannot think straight and tests me to no end. But somehow Glenn thrives in it, and just keeps pedalling along. This is very fortunate, becuase if we were both on the verge of breaking down (as I, admittedly, am) we might not still be riding our bicycles... But Glenn is able to stay strong for the both of us, and I just concentrate on pushing through the discomfort, focussing on the fact that it will not last forever....will it....? But Mexico has not just been heat and more heat... We have met some incredibly kind people along the way, who have taken us in and offered us food and cold drinks. There are long lonely stretches in the Baja, but about every 30-50 km you come across a Ranch, where normally there is food and cold drinks available. This has been a pretty great part of the trip as we usually linger at these places which often offer a bit of shade, and folks have been ever so patient with our very minimal Spanish skills. Can't see the slideshow? Click HERE to be directed to our full photo gallery. Just over a week ago we also hit another milestone...hard to believe but 7777 km has come and gone...as per usual a little musical celebration was in order.... This time with the bugs and sweat of early morning. 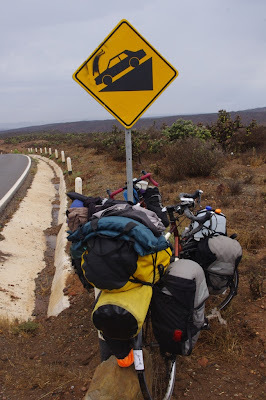 We have about 350 km left before we reach La Paz, where we will take a ferry to mainland Mexico, the ride will take us back into the mountains, yet again, then back to the coast , yet again! We hope to do it in four days.... Wish us luck!